I met Ed Kohl last year at a Signatory tasting hosted by Travero’s in Santa Rosa. He’s got a really great presentation, a winning personality and a deep knowledge and appreciation of whisky. Signatory tastings present expressions of great single malts in ways that the consumer would otherwise never taste. We invited Ed to join us the following week at The Hamilton Whisky Society for a casual get together. We had a wonderful time with some great drinks including a Highland Park 25 OB, Signatory Highland Park 24yo 1977, Signatory Caol Ila 13yo 1990, Signatory Caol Ila 6yo cask strength, Signatory Tamnavulin 24yo 1978 and Signatory Clynelish 29yo 1974. The Clynelish is a sublime whisky. The 6yo Caol Ila is a favorite of mine, all fire and peat with just a little hint of grains and cereal showing through from it’s young age. 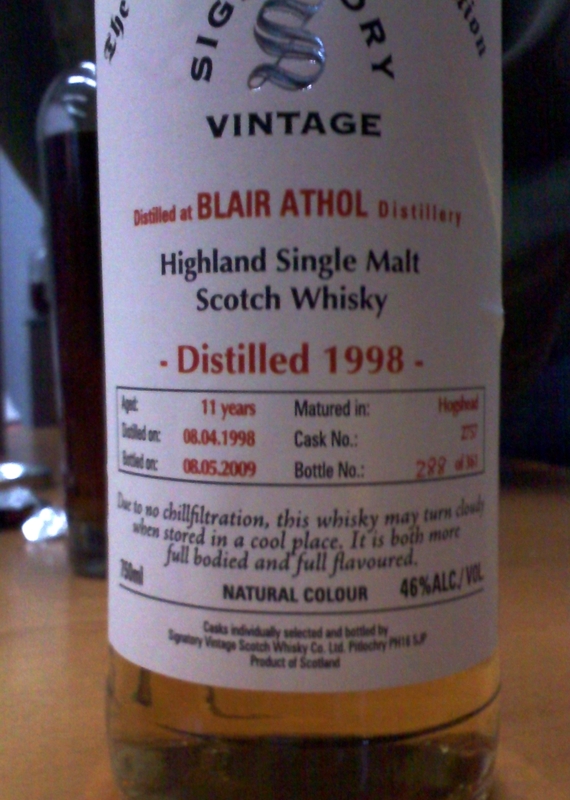 Ed was kind enough to gift us with a brand new Signatory expression from Blair Athol, a distillery that is new to me. It’s a wonderful light and fruity whisky with hints of citrus and stone fruit. I recall apricots but I’m going to go back and taste it again at this weeks meeting. This bottle was fresh off the boat and we were fortunate to taste it as a preview before it hits the shelves. Notice the bottling date of 8/5/2009. That’s just about 1.5 months prior to our tasting. Thanks Ed!